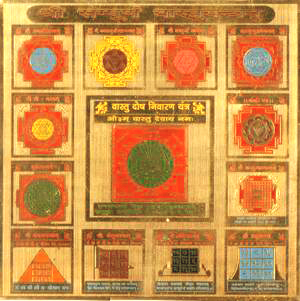 Yantra to remove ill effects of Vaastu from residence/place of work. Astrojyotishi provide energised Yantras that are purified personally by us, by reciting the Vedic mantras along with the Homa done. Send us your Map for a detailed Vaastu analysis of your residential as well as commercisl property and get best remedial measures for the same. Get a personalized Vaastu analysis of your residential property done by us. These service Charges are for India, For International visit please contact via email. 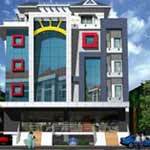 Get a personalized Vastu analysis of your commercial property done by us. These service Charges are for India, For International visit please contact via email. 2. Avoid keeping any water feature or plants in the bed room. 4. Place a picture of bright sunrise on southern wall in living room. 5. Never put mirror in kitchen. 6. Do not keep prickly cactus, plants in the house. 7. Place an aquarium in the south-east corner in living room. 8. In the office, sit facing the door. 9. Hang a picture of mountains behind you in the office. In a place of worship in the house it is necessary to have open atmosphere. Use marble in the worship room. Take care that there is enough light and air. Latrine should not be near worship room. Keep cleanliness and always light incense sticks. 1. The shape of the land, roads, uninterrupted availability of water and electric power etc. should be kept in mind. 2. According to `Vaastu Shastra` the main gate of factory should be kept in the East, North or North-East of the plot. All other doors can be kept in North-East, East, North or North-West. 3. The guardroom of the factory should be in North-West of the Northern gate and to the South-East of Eastern gate. 4. There must be open space in the North- East. The land of the factory should be elevated in South-West. 5. The store of the factory should be in the South-West. 6. The North-West corner should be used for car-parking. 7. The administrative block should either be in the North or in the East. 1. Tips for office1. Money and valuables should be kept in an Almirah or safe facing north. 2. If north is blocked it can be cured with the help of regulators. 3. A boring or tube well in south is very harmful for finance. 4. A pit or under ground tank in south is also very harmful for finance. 5. Certain pictures of god goddess and proper placement of mirrors brings financial gains in the house. 6. Water flowing from north to east is very good. 7. A water fountain in the north east part of the house or factory is very good. 8. An aquarium with 9 gold fish and one black fish, in the north east corner/portion of the house or factory is very good. Tips for Home The architecture of our homes can damage our health, the air we breathe and the water we drink, without our even being aware of it. 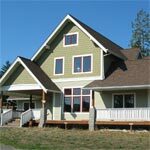 We all care about our homes and spend time, effort and money, trying to make them more comfortable. Similarly, at the places where we work, environmental stresses contribute to overall load, preventing us to reach our full potential. Resisting these external forces becomes more important for growth and development. NorthWest - The room in this direction is suitable for guests and girls. South-West - The Chief of the house should have his room in this direction. North-East - No bedroom should be situated in this direction. In such situation there is a possibility of increase number of girls in the family. South-East - No bedroom should be located in this direction. The children do not take interest in studies. There is no sound sleep. People have much anger. Decisions are generally taken hurriedly. Bed Room - According to Vaastu, the master bedrooms should be in the South-West corner of the house. If the house has more than one floor then, then it should be on the top most floor.The ceiling should be in level, this makes the energy of the room uniform, which in turn gives one a steady state of mind. Children s room should be in the north west or west side. To have a better concentration they should have a separate study close to their bedrooms. Kitchen -The kitchen must be situated in fire angle, i.e. in South-East. The face of the cook should be towards the East. The water tap in kitchen should be in the North-East direction. It is better if the stone on which food is cooked, is of red colour. Store Room- If essential then the store room should be constructed in the southern part of the building, other wise grain and other provisions can be stored in the kitchen or in other rooms and cupboards. Things should not be stored in diwans and box beds because it effects the magnetic environment of the self and the room causing sleeping disorders. Waste Storage- Daily wastes from the kitchen should be kept covered in the south- west corner of the kitchen. Water-Tank- It is best to keep it in the North-West, but could be kept in West also.